Fast forward to three years later: I was on my way to dinner at a halal Korean eatery when I chanced upon The Orange Lantern at Harbourfront Center. 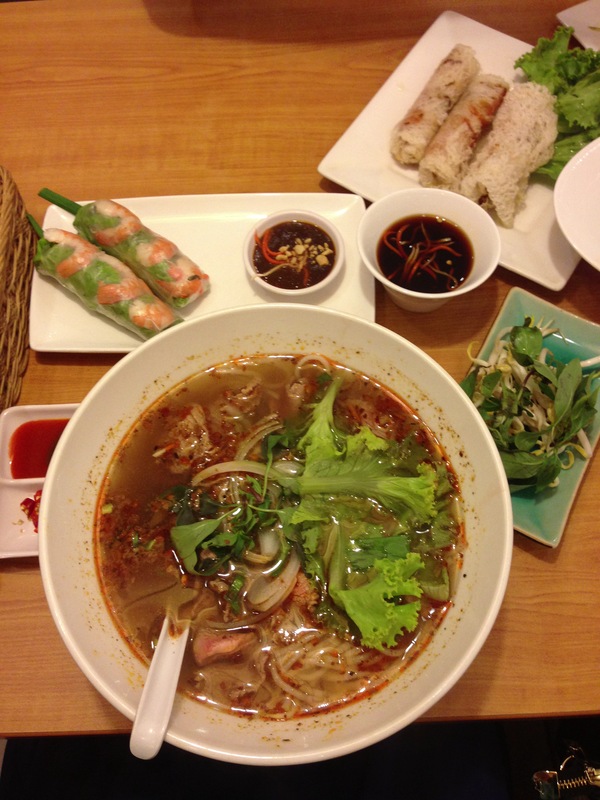 I saw the halal certificate and got very excited at the possibility of finally eating phở! I’ve since visited The Orange Lantern thrice now, with different groups of people, but I always order the same thing. Guess what? Before I start rambling about how yummy the food is, let me just tell you about The Orange Lantern and how it started. When I first heard about The Orange Lantern three years ago, they were a small eatery tucked in a nondescript corner of Harbourfront Center (#01-98 HarbourFront Centre). Unfortunately, Harbourfront Center is located at a corner of Singapore I rarely visit so I never got around to visiting it. When I heard that they had opened a new outlet at Killiney Rd (73 Killiney Rd), I knew I had no reason not to try out their food! They’ve been in operation for quite some time now and according to their website, they serve “authentic & different” Vietnamese food. As a disclaimer, please note that my review is solely based on my personal experience with the Vietnamese food served here and I cannot vouch for the authenticity because I have never eaten Vietnamese food at any other eatery. Located along Killiney Rd, it’s actually pretty accessible by car and train. The few times I’ve been there, I’ve taken a train down because I noticed that there are limited parking lots in the area (mostly street parking). It’s about a 5-minute walk from Somerset MRT Station, and if you need a landmark to guide you, look out for the Singtel building -you can’t miss it. The Orange Lantern is situated in a row of shophouses directly behind the Singtel Building. When I first walked into The Orange Lantern, what struck me the most was how true to its name the eatery was! 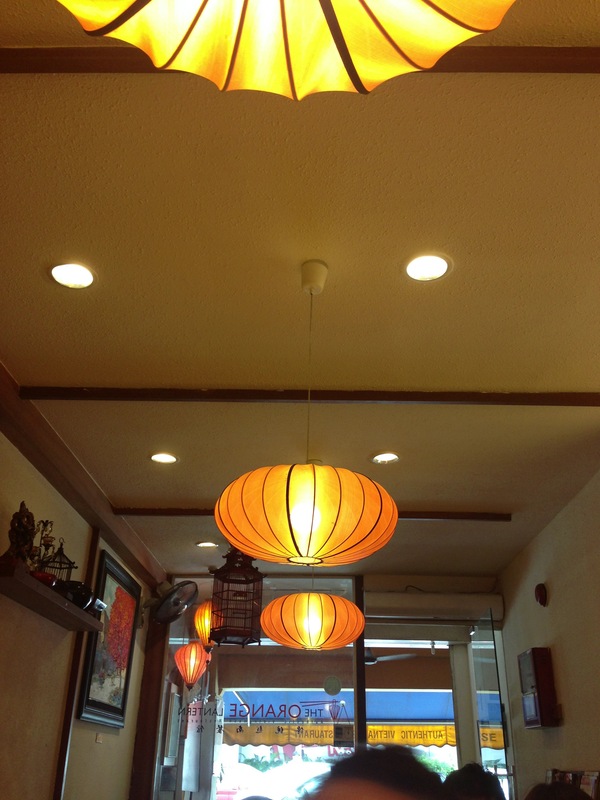 My eyes immediately caught sight of the orange lanterns hanging from the ceiling and how the entire restaurant had a very orange-tinged atmosphere. Now, the orange lights do add to the slightly romantic (and I suppose exotic) ambience of the restaurant which I like but some people might find it a little too dark for their liking. However, the restaurant does have glass doors which enables natural light to stream through and there is also outdoor seating for those who prefer that. Given its location, it is not as busy as other mainstream eateries but I like it that way because I don’t have to wait too long for food to be served and I get excellent service whenever I’m there. Most of the seats are 4-seater tables and there are some 2-seaters but I do believe if you’re coming in a large group, they can move tables around to help you form a larger table. 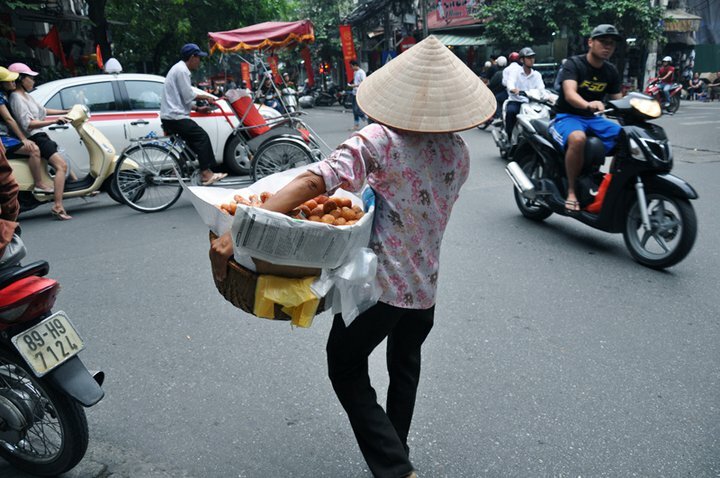 Unlike newer eateries where you fill up a form and submit your order, this Vietnamese eatery follows the traditional ordering method, where a waitress comes up to you and takes your order after letting you take your time to peruse the menu. The last few times I’ve patronised them, I’ve been attended to by Vietnamese staff which I believe adds to the whole authentic feel of the place. Since I still haven’t gotten over my unfortunate luck while in Vietnam three years ago, I always order the same thing when I go to The Orange Lantern. Perusing their menu is always an exciting experience for me. I love discovering the different dishes and but I never fail to order my favourite dish on the menu: their Special Chili Beef Noodle (SGD12.80), commonly known as the chilli beef phở. The chilli beef phở is my absolute favourite dish at The Orange Lantern because it is one of the most flavoursome soups I’ve ever tasted in a restaurant. The dish is served with flat rice noodles, a generous serving of beef balls, thick slices of beef and beef brisket. It is also accompanied by bean sprouts, a serving of chilli paste, cut red chilli and bay leaves. The accompaniments are served separately so you can add it into your soup if you prefer it or you don’t have to add anything in, and still be able to enjoy it. I usually don’t bother about the accompaniments because I think that the soup in itself is so full of flavour and spice that I don’t have to add anything in to enhance its flavour. Occasionally, I do add in some bean sprouts to add in some extra crunch as the bean sprouts are raw and are meant to be cooked by the heat of the soup. But, really, even without any extra added ingredients, the soup is, in my humble opinion, spectacular. The chefs do a great job at ensuring that the stock is rich and full of flavour, and the ingredients that accompany the dish, such as the beef brisket and the spices are married together so well. If you’re not a fan of spicy dishes, there is also a non-spicy variation of this dish: Special Beef Noodle Soup (SGD12.80). And if you are wondering if the lack of spices will affect the taste of the soup, you don’t have much to worry, the soup is still as delicious as its spicy counterpart. When Kit and I first visited The Orange Lantern, she ordered the Vietnamese Vegetarian Curry With Rice Or French Loaf (SGD12.80). 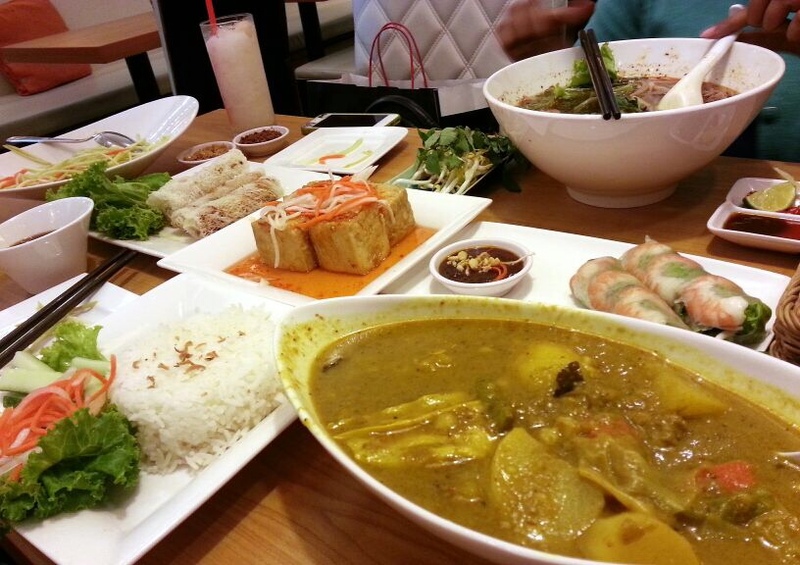 Both of us didn’t know what to expect because we had never tried Vietnamese curry before. My experiences with curry have been primarily Indian and Thai in nature so I was interested to see what Vietnamese curry was like. It appears very much like that of the Japanese curry, thick and rather stew-like in nature. This is of course in comparison to Indian curries or the Thai curry which is more watery. Similar to the Japanese curry, Kit’s curry wasn’t red but brown/yellow in colour. It looked deceptively mild, but according to Kit, the colour throws you off guard and the heat of the curry will hit you as you continue to be tricked by its mild colour. The curry definitely burns, but it’s not an immediate burn that you get on your tongue. It takes a while for the tongue to register the heat, but once it does register, you’d better have some water (or a lot, actually) nearby. Kit chose to have her curry served with rice, which she later admitted was probably the best choice because the plain rice proved to be the best accompaniment to her spicy curry. The plain white rice helped to soothe the angry taste buds and was the perfect vehicle to carry the taste of the curry through without completely killing her taste buds. If you’re afraid of spice, you can actually highlight to the waiters your concerns and they will be more than willing to accede to your requests. Kit and I learnt this when we made certain requests to turn non-vegetarian dishes into vegetarian ones so that we can both share the dish. We have actually tried this at quite a few restaurants and we’ve learned that sometimes, all you need to do is ask. We’ve been so impressed by the standard of most of the dining establishments we’ve patronised – they are always so willing to turn non-vegetarian dishes into vegetarian ones for us, with nary a complaint! When we perused the menu, we realised we wanted to try the mango salad (SGD8.50) but it was tossed with some fish floss (which Kit cannot take). We also wanted to order the Deep Fried Golden Tofu with Chicken Floss (SGD7.40) but again it was served with chicken floss. When we explained our circumstances to the staff, they were willing to prepare the food without the floss and place it on a separate plate for us (in case I wanted to try it with the floss). Their thoughtfulness , plus the fact that they did it with a smile on their faces, was something we both appreciated. In fact, when we told them we were looking for vegetarian dishes, it was they who suggested leaving the floss out and serving it on a separate plate. The mango salad was quite typical of other mango salads that we’ve tasted and isn’t that different from the Thai mango salad. If you’re wondering why it is that expensive, it is because it is quite a large portion and can be shared quite easily by four hungry people. Their tofu dish however, was so yummy! They use a soft tofu that is coated in flour lightly and then deep fried before it is placed in a sweet chilli sauce before serving. Kit really enjoyed this and I watched her devour tofu after tofu. I remember her exclaiming with every bite how soft the tofu was! 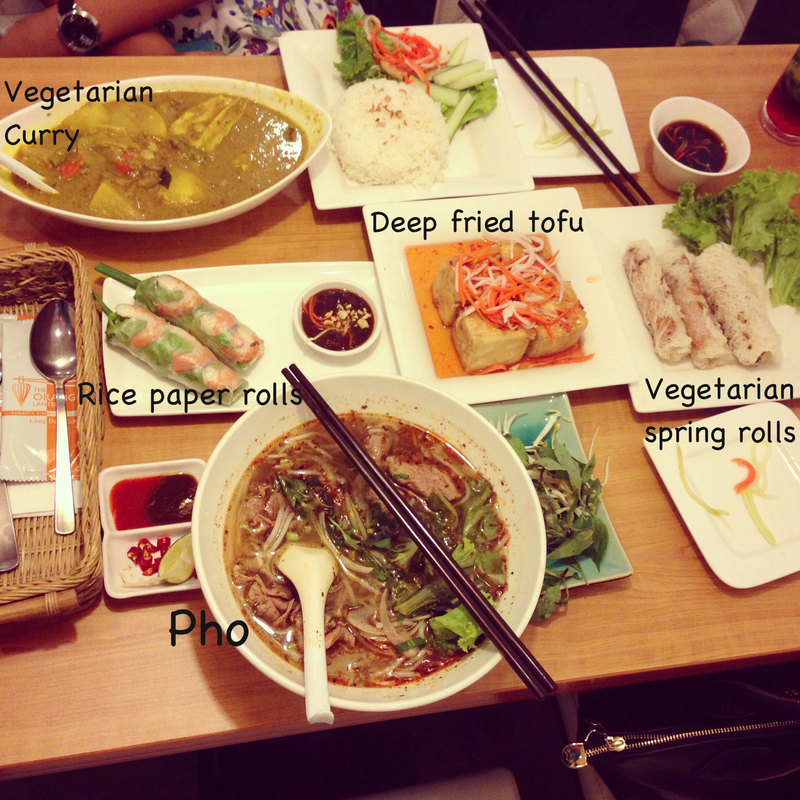 On top of this, we also ordered the Vegetarian Spring Rolls (SGD7.40) and the Rice Paper Rolls with Chicken or Prawn (SGD7.00). The former comes with a serving of four and is actually Vietnamese spring rolls with a crispy netted rice skin wrapped with lettuce, basil leaves and the chef’s special Vietnamese dipping sauce. I remember it being quite sweet and I reckon that has something to do with the special dipping sauce. It’s deep fried so that it is crispy and crunchy on the outside but hot and soft on the inside. The latter is a Vietnamese favourite: rice paper rolls with prawn or chicken and served with a special sweet sauce as well. Unlike the vegetarian spring rolls, these are not deep fried but are possibly steamed. Thus, the skin is soft and stretchy when you bite into it. What struck me the most about this dish is the very minimal and natural taste of the dish. Unlike the traditional Singaporean popiah that is deep fried or that is served with a smear of thick black sauce, this one is definitely more bland and a lot of the taste comes from the dipping sauce. Even the prawns or chicken in the rice paper roll is steamed instead of being deep fried beforehand. Not everyone would be a fan of this dish, especially if you’re a fan of intensive flavour combinations. However, this dish does give you a good idea of the basic Vietnamese flavours and how Vietnamese food is often about using simple ingredients and not trying to add / change / take away too much from the original flavours of the ingredients. I’ve been back now to The Orange Lantern thrice and I absolutely love the food, the service and the ambience. The restaurant is on most days, quiet (especially if it’s not during the lunch time crowd) which makes it a great place to sit and have a nice, long catch up with an old friend. You could sit for hours, enjoy some Vietnamese coffee, read a magazine (Which I saw someone doing with a bowl of soup to accompany him) and no one would badger you to leave! I hope they open more stores in the future though I’m quite sure that if they do, part of the appeal of this charming restaurant would disappear. Well, if they do, I hope they maintain the authenticity of the restaurant as I know it. If you’re up for some soup this weekend, this might just be the right place for you. Try it, you’ll be glad you did! Bus Services: Nearest buses are to Somerset MRT Station /Habour Front MRT station or Harbour Front Bus Interchange at Seah Im Road.